Clash of the Titans-Old Vs. New | Which one do you like? When I was going through my movie box, which I store all of my movies in, to see what to write about next, I came across these two movies. 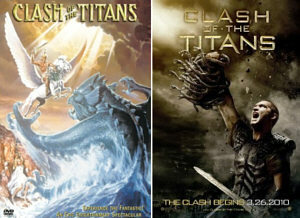 The 1981 version of CLASH OF THE TITANS and the 2010 version. They both have the same plot of the struggle of man against the gods and about Perseus who was a born of a god, but raised as a man. He is to make his own destiny and become an hero. But at the same time they are different. In the 2010 version there are more gods (including Hades) and the graphic scenes are better, but nothing can take the place of the classic 1981 version. Personally, I like them both. So which one do you like? Comments for Clash of the Titans-Old Vs. New | Which one do you like? are now closed. Movie Vine / News / Clash of the Titans-Old Vs. New | Which one do you like?